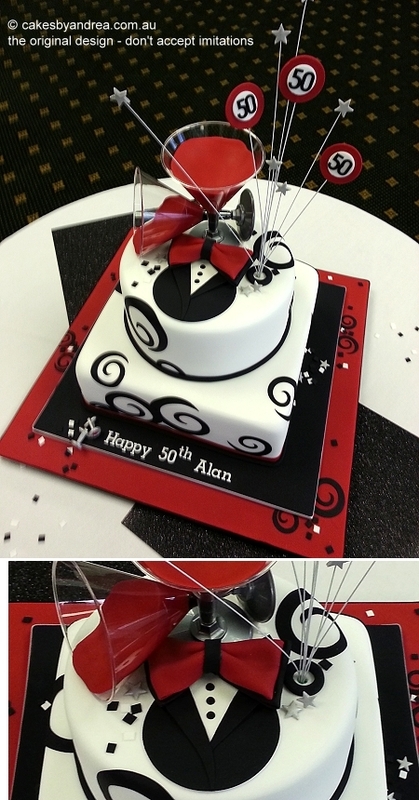 These cake designs are top of the range versions and have been designed to be stunning centrepieces for the occasion. They feature extra tiers, extra design elements, extra bling, and extra creativity to make them pop. Two-tier red 40th birthday cake featuring hand-made sugar paste shoes, black inlay-effect swirls, butterflies and stylised flowers, with diamante trim on double fondant covered boards. 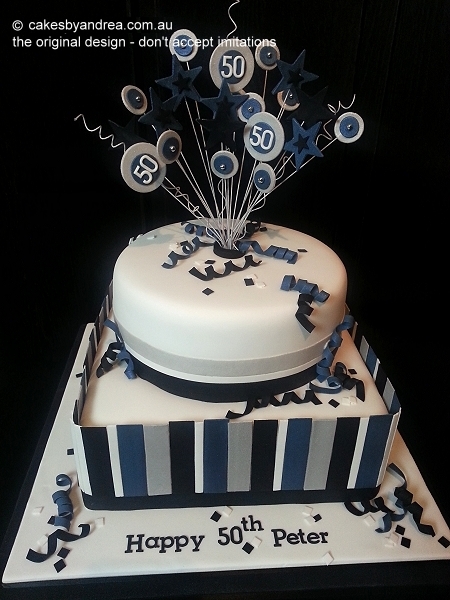 Two-tier 50th birthday cake featuring square cake with blue, silver, white and black stripes (stripes are all hand made from sugar paste), and round cake on top with matching fondant ribbons and #50 poppers and twirls. Finished with inscription and scattered confetti (edible, hand made from sugar paste). 2-tier birthday cake for men featuring hand-made icing sugar tuxedo, bow tie, cufflinks, filled martini glasses, inlay-effect swirls and #50 poppers. 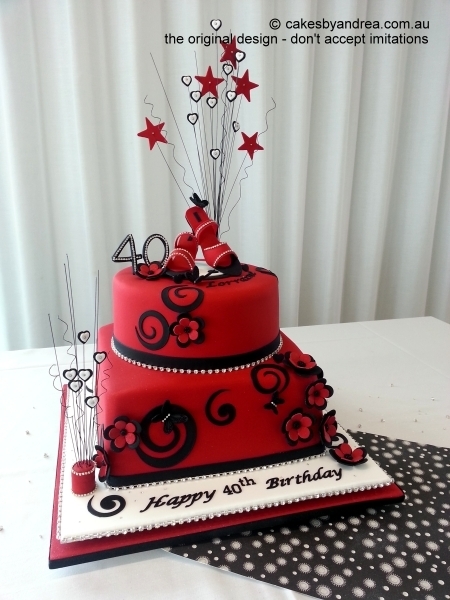 The white fondant cake is set on double fondant-covered boards in black and red, with happy birthday inscription. 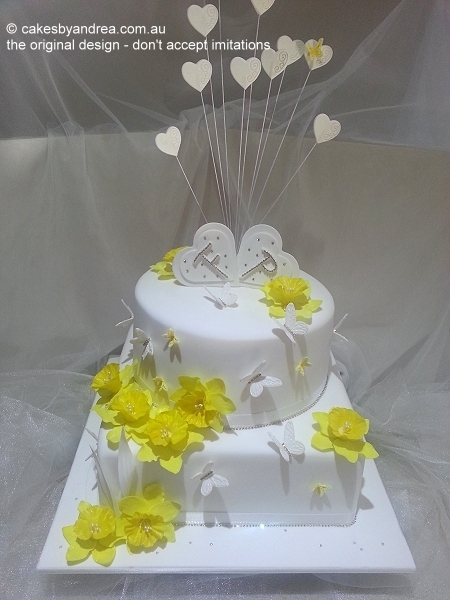 White 2-tier wedding cake featuring yellow sugar-paste daffodils, white diamante-backed butterflies and custom-made hearts with dimensional diamante monograms on top. Finished with diamante ribbon and diamante-studded fondant covered board. Two-tier 45th birthday cake featuring inlay-effect swirls and stylised flowers on red fondant, with diamante number 45 and ribbon. Inscription and scattered decorations on double fondant covered boards. 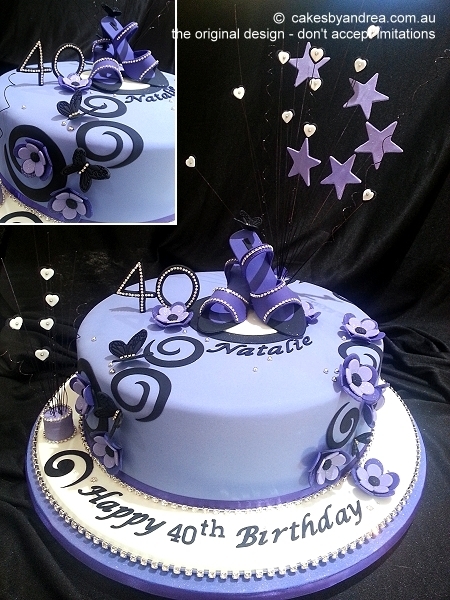 40th birthday cake featuring hand-made sugar paste shoes and number 40 with diamantes. Design flows across cake with inlay-effect swirls, diamante butterflies and modern stylised flowers, on double fondant covered boards with inscription. 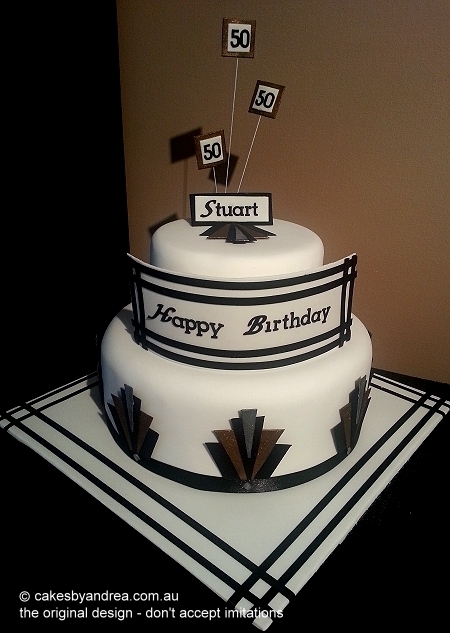 Stylish art-deco inspired birthday cake featuring hand-made sugar paste geometric motifs, inscription plaque and poppers. Set on fondant covered board with matching twin ribbon design. 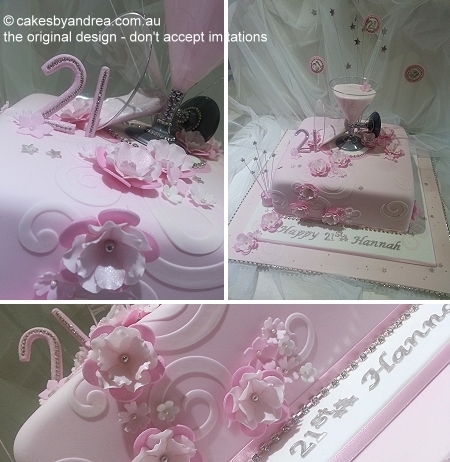 Glamourous 21st birthday cake featuring filled martini glasses, stylised blossoms, swirl-effect motif, diamante highlights, tiny star and 21 poppers and hand-made sugar paste #21 with diamante’s. Finished with inscription on double fondant-covered boards. 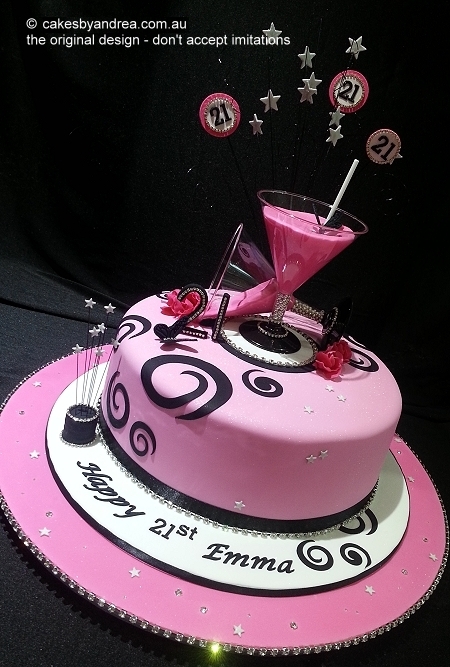 Stylish 21st birthday cake featuring filled martini glasses, swirl inlay-effect motif, stars and #21 poppers, diamante trim and extra bling with exquisite mini roses. Set on double fondant covered boards.